Click here to RSVP for this Complimentary Event for Wharton Club Members & Guests!!! The evening at the University Club will explore the ways in which science can be applied to the brewing process and will speak to the effects geographic location can have on the brewing process and flavor combinations. Learn about the defining characteristics of different brews and how variables such as water play a key role in taste. Hear specifically about water differences in Sweden, Luxembourg-Belgium (Ardennes), Germany and Baltimore and how they determine beer styles in those regions. The general topic of beer will also be covered as we delve into the expansion and growth of an award-winning local craft brewery, RavenBeer. Interactive components of the event include beer sampling and a chance to pick Stephen Demczuk’s brain. There will also be a drawing for prizes. You will also have an opportunity to take a tour and learn about a special opportunity to become a member of the prestigious University Club. Click here to REGISTER for this Complimentary Event!!! This is designed to be a fun, informative, “spirited” and social evening that is as appealing to novice beer aficionados as it is for experienced connoisseurs. The evening includes sampling of various RavenBeer specialties and the creative marketing spark behind the company. Stephen Demczuk, Ph.D., founder and president of RavenBeer, grew up in Dundalk, MD, and is a graduate of Patapsco High. He played lacrosse and football at the University of Maryland, where he graduated in Zoology and Chemistry. He went on to receive a master’s degree in Cell Biology at Long Island University, then attended Stony Brook University, and received a master’s degree and PhD at the University of Oklahoma in biochemistry and molecular biology. He completed his post-doctorate studies in Geneva, Switzerland, was an assistant professor of research at Wake Forest Medical School, and then was a visiting scientist at the Karolinska Institute in Stockholm. By then, Stephen got the beer bug and moved to Luxembourg with the goal of building a brewery/brew pub, but instead started the first beer-of the-month club in Europe (Beer Around the World). Through the beer club, he met future partner Wolfgang Stark. 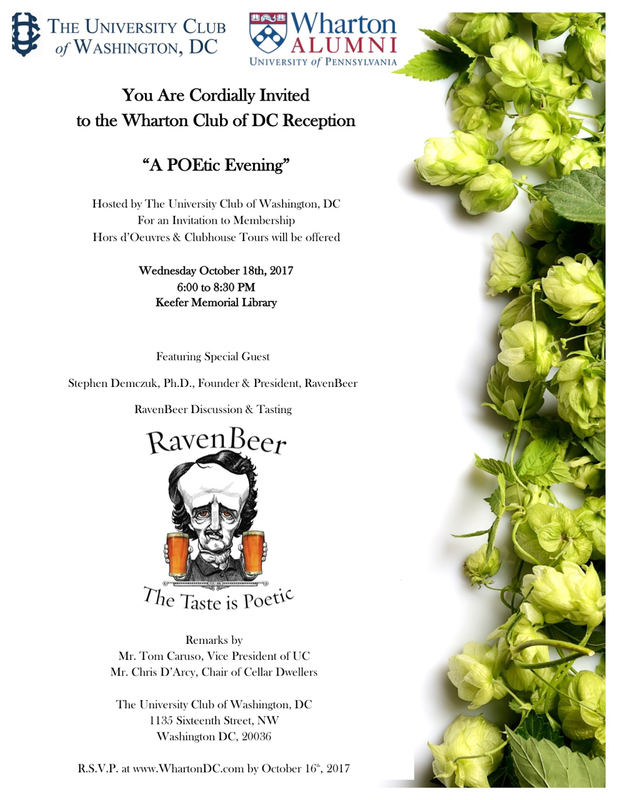 Together they brewed Raven Special Lager in Germany, named in honor of Baltimore’s master of the macabre, Edgar Allan Poe. While in Luxembourg, Stephen had his own radio show, “Beer and Jazz,” on Radio Luxembourg. Stephen moved back to the US to brew Raven Lager in Baltimore. With two partners, he built Peabody Heights Brewery in Charles Village and launched the Edgar Allan Poe series of beer in 2012. Stephen is currently working on brewing and exporting his beers to other countries, developing a National Theatre dedicated to Poe, and creating a merchandise company based on the cartoon caricature of Poe— Poe Creations. In 2015, one of his styles of beer named The Cask, a double-bock, won Gold in the 10th Annual Maryland Craft Beer Competition of all the beers produced in Maryland and took Silver Medal in the International lager contest at the Beverage Institute in Chicago, and other varieties have also won coveted awards. REGISTER: Wharton Club Members & Guests - Complimentary for you and a guest. First come, first served.